When Nigeria dispatched a jet from its Presidential Air Fleet late last month to fetch Malawi’s President, Joyce Banda, to Abuja, it unwittingly drew attention to our government’s fiscal recklessness. It was lost on President Goodluck Jonathan that while Banda had sold her cash-strapped country’s only presidential jet to save costs, he has, in three years in office, expanded Nigeria’s executive fleet to 10 aircraft. 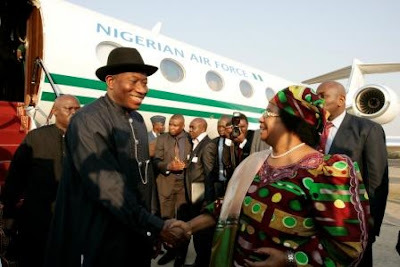 Neither the reality of over 60 per cent of the population living in poverty, nor the recent alarming revelation by the Finance Minister, Ngozi Okonjo-Iweala, that government’s revenue inflow had dwindled to a dangerous level, has persuaded Jonathan to pare down the size of the Presidential Air Fleet. Instead, it is projected to rise as provision has reportedly been made to purchase two additional helicopters to ensure the President, Vice-President, their families, and other top functionaries travel in luxury at public expense. Banda was in Nigeria to deliver the keynote address at the Global Power Women Network Africa summit in Abuja at the invitation of Nigeria’s First Lady. To ease her trip to Nigeria’s capital, our generous government dispatched a jet to pick her from Lilongwe, Malawi’s capital, and return her home after the event. That is to be expected since Malawi lacks a presidential aircraft. Shortly after assuming the presidency in 2012, Banda had taken a critical look at her country’s economy. Almost 40 per cent of the national budget came from aid donors, while revenues from its major exports – tobacco, tea, coffee and sugar – were falling due to lower global demand and prices. Moreover, the International Monetary Fund and the World Bank had withdrawn most aid in response to the purchase in 2009 of a presidential jet by Banda’s predecessor, Bingu wa Mutharika, and his abandonment of an IMF-dictated adjustment programme. Other donors followed the World Bank/IMF lead. Besides selling the presidential plane for $15 million, Banda also sold off a fleet of 35 Mercedes Benz limousines reserved for the president and the cabinet. She cut her own salary by 30 per cent, among other austerity measures. Her actions won praise around the world and convinced the IMF and other aid donors to return with credit and handouts to back the government’s ongoing painful structural adjustment programme. But Nigerian leaders will not sacrifice their own comfort for anything. Even in a rich country like Britain, Prime Minister David Cameron and cabinet members took pay cuts in response to the global recession and the spending cuts that the government introduced. Here, our leaders are obsessed with living in luxury, regardless of the mass of people who are poor, the lack of infrastructure, mass unemployment and dwindling revenues. Okonjo-Iweala’s warning that the government may run out of money to pay salaries by October in the face of massive oil theft and vandalism of pipelines that have sharply reduced oil production and revenues has not jolted officials. Neither the wasteful Executive nor the overpaid legislators are ready to give up their luxurious lifestyles. But British leaders often take commercial flights and, occasionally, trains when travelling for state functions. Japan, with its Gross Domestic Product of $4.52 trillion and per capita income of $36,200, (at Purchasing Power Parity), has only two aircraft – Boeing 747 – 400 – for use of the prime minister and the emperor; the Netherlands, with GDP of $770.2 billion and PCI of $42,300, has two; the British Queen, Elizabeth II, and Cameron travel on chartered British Airways flights, despite their country’s $2.32 trillion GDP and PCI of $38,700; South Africa has just one presidential aircraft with its GDP of $678.6 billion and PCI of $11,300, though it expects another soon, while Malaysia has one, but has also ordered a second; but with its GDP of $492 billion and PCI of $16,900, like others cited, Malaysia is ahead of Nigeria with a GDP of $450.5 billion and PCI of $2,700. Given these scenarios, it is high time we ended this absurdity. Today, the aviation sector is in dire straits. How does one explain that only two domestic airlines – Arik, with 23 planes, and Aero Contractors with 14 – have larger fleets than this one kept for a few at public expense? Over N9 billion is believed to be spent on the maintenance of the presidential fleet each year, while the PAF required 47 Nigerian Air Force officers, 173 airmen/airwomen and 96 civilian employees on full time call in 2012. Nigerians, however, desperately need a government that exists to serve the people, not a few. Successive governments have demonstrated incompetence and abused and misused public funds. There should be minimum ethical standards and decorum in public office. Other developing nations like Ghana where a former president, John Kufuor, once disposed of a spare presidential aircraft, retaining only one, should shame us into prudent conduct. Jonathan has no excuse to continue keeping 10 aircraft and our under-performing legislators have no reason to keep approving new purchases or the billions of naira they appropriate for their maintenance each year. But, ultimately, it is only when the electorate shakes off its lethargy and demands accountability and responsibility from public officials that things will change for the better. NIGERIA- WHAT A HELL-HOLE OF A COUNTRY ! 4 me, I beliv we’re @ fort, when we c dat dis set of people are oppressing Us Y can’t we come out and protest even if it’s going to lead to revolution? The greatest weapon in the hand of d oppressor is d mind of d oppressed, dey kip telling us dat we’r d leaders of tomorrow, I don’t kno wen dat tomorrow wil came wen d people dat rule In d 80s are stil d set of pple ruling, den wen will I be d lead of tomorrow?